How to organize an editathon-a? NAME: One of the main goals of an Editatona is to bring emphasis to women’s issues. For this reason, we suggest that the name “Editatona” remain untranslated. “Editatona” is the female term for an editathon in Spanish and we believe that keeping the name brings attention to the relevant issues. The first thing that people will ask is “why is it called Editatona?” and that in itself will bring more people to think about the issues being addressed. Also it makes it obvious for women to find this place as one planned for them. Inviting people to organise the editatona! 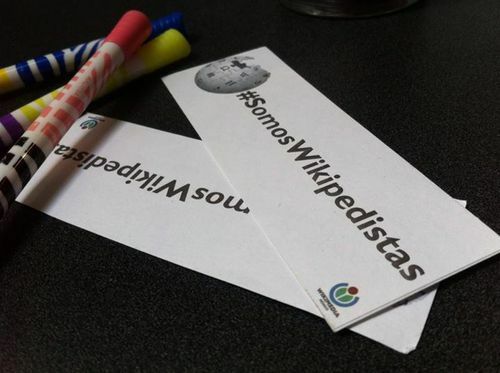 In October 2014, Wikimedia Mexico searched for local support to develop this new effort and get the interest and commitment of SocialTIC, an NGO dedicated to promoting and enabling social groups to strengthen their activities through technology. Carmen Alcázar (User:Wotancito), Mariel García and Indira Cornelio led this effort in the following months. Then we reached out to other organisations and collectives to be part of the organizing team: Luchadoras, Mujeres Construyendo, La Sandía Digital, Dominemos las TIC - APC. 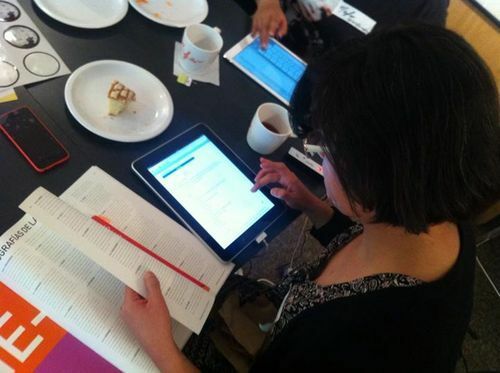 According to the previous experience of the Mexican chapter, two of the critical items of a successful editathon are connectivity and easy access to documentation. So, we went to a Women’s Institute to ask for the space to hold the event. They offered a nice place with internet and kitchen. We had several ideas of things to edit on the Spanish Wikipedia (women femicides, feminisms), so we started by deciding what to focus on: Feminism. All the organizations helped make a list of all the articles that we wanted to work on, the new ones and also the ones to edit. We left the other ideas for other Editatonas and schedule them for the following months. Create a powerful image that can function as a logo for your Editatona. Make sure it can effectively communicate like a snapshot the meaning of the event. Include elements such as images of women, Wikipedia and/or technologies. Be aware of not using stereotyped images of women, we recommend to portray diversity in age, cultural and professional background, if you are to held a local event, make sure images can promote self identification, think of your potential audience. Publicize your event using the designed image, think of banners and Facebook events. Be sure your allies share it too. Reach relevant media is desirable. Send emails and share the invitation with other groups and organizations, so you can reach their audiences too. Take time to map out potential participants – especially women. For our Editatona, we mapped out women who were already creating content (just not on Wikipedia) because we thought they’d be natural adopters. We did a registration form where we asked the women who wanted to participate, among other things, what articles they were interested in editing. Also we asked them in the form to create the account in wikipedia in case they didn’t have one yet. This is really IMPORTANT because if you create more that 5 account from the venue, the IP can be blocked. Will some of your potential participants refrain from attending because of child care duties? Make it ok to bring kids by offering a safe space for them. How long will your event be? Plan your refreshments accordingly. If you don’t have a food budget, it’s OK to ask participants to bring food to share (in Mexico, they brought fruits, biscuits and baked goods). Cleaning and order. Make sure you bring cleaning supplies (and don’t forget extras like napkins, toilet paper, soap), and, if necessary, put away items that could get damaged during the event (take pictures first to remember how everything was placed). Make sure to be specific on the conditions to participate: people MUST be registered or they can simply show up during the day? Can they bring guests? It is important to make the rules clear from the beginning in the invitation and in the confirmation to participate. Always go to the venue before the event and check the Internet conexion to see if it is going to work. For the people working in groups the same article we used google drive but also you can use hack pad. We had also women joining from other parts of Mexico and Argentina so we used CryptoCat to organize their collaboration, especially to see if they were going to work in some articles with women in Mexico. We shared the information about the chat in Cryptocat directly with the participants, to avoid trolls. The first thing we did the day of the event, as Wikimedia Mexico performs in every event, was a newbies workshop on how to edit wikipedia and basic rules. 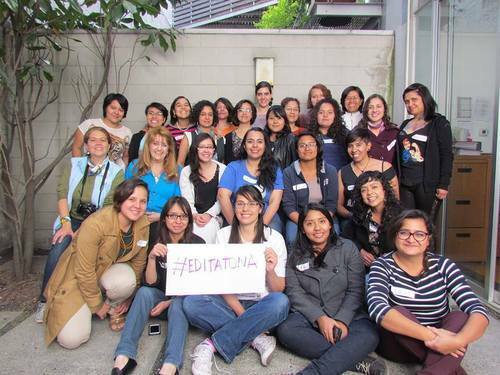 The workshop of the video is available in http://editatona.luchadoras.org/ The hangout url was shared online. We also thought about including some other workshops to motivate women to participate for example, on the first Editatona we had a workshop on how to edit Wikipedia but also one on Inclusive language. And in the second one we will have a conversatory on Feminist Internet. We consider this type of spaces on the Editatona to be necessary, so the women who attend get the time to know each other and also to learn more about technology or about other important topics. And also to have the chance to strengthen and build new networks. We want to create a safe and welcoming environment for everyone – especially feminist groups attending and who may be under threat. For this, it is important to give people the chance to opt in or out from appearing in photos and video. You can do this by asking them up front when they arrive at the event, and giving them a ribbon that shows their stance on this. To start it is important to take a moment to get to know each other, you can think of very creative and fun ways to get people to introduce themselves. To begin with the work, you can create a list with the participants (also with the ones working remote) about the articles they are planning to work on. Document your event and share! Take video and photographs during the event. Make sure beforehand your equipment is in good shape, batteries charged, enough free space on memory cards, and good microphones. Prepare a short list of potential questions to interview attendees and be aware of the agenda items in order to record important moments and to build the story you want to tell with your audience. Edit the materials as soon as possible, you’ll have fresh creativity and the momentum of the event on the tip the tongue. If you need extra material for production such as music, search of free licensed materials in http://creativecommons.org/ Our video is available here! Share outputs of your photo materials during the event through social networks, and after the edited video and invite allies and attendees to write blog entries about the event during the following week. 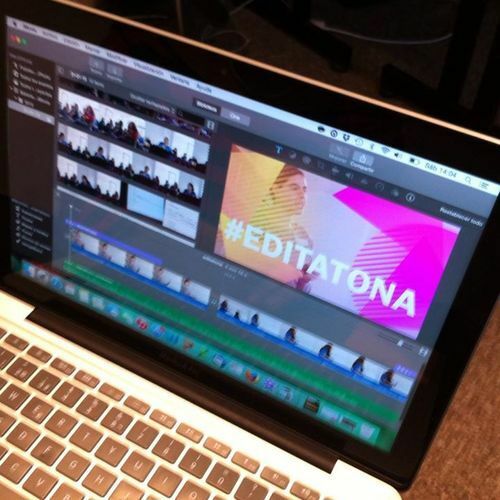 Showing how fun the Editatona is will also attract more participation for coming sessions. The Editatona may fall short for the amount of time it may require to create or edit fully a Wikipedia entry as you desired, specially if it is the first one. People are just beginning to learn how to edit Wikipedia maybe. So it is important for you to keep on working with them after the editatona is finished. Make sure to keep track of the entries to be edited and the participants engaged in doing it, monitor advances from time to time. You can create a Facebook page in order to keep up the momentum and bring together the group in order track advances and to enable a forum to share editing experiences and questions on the process. Talk about what went great and what could be improved. What people shared during the event about the session and on social media? Include the feedback on the strategy for the next Editatona.